Download the latest version of CVSNT (look for free version) and install it. Use typical settings. Restart PC. 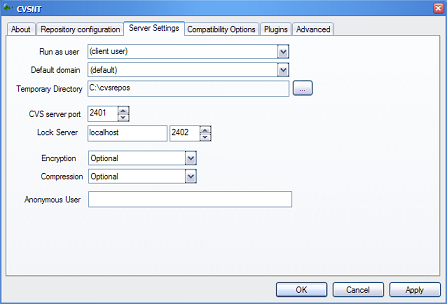 Open up "CVSNT Server" in control panel. Stop the CVSNT Service. You may leave the Lock Service running. Then, go to "Repository Configuration" tab. Click "Add". 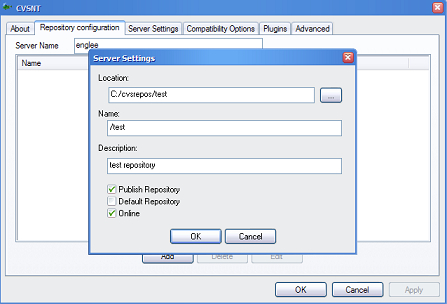 Select a location that will serves as the repository for your source files. Press "Yes" when it requests you to initialize. Next, go to "Server Settings" tab. Change the "Temporary Directory" to somewhere better. Go back to the first tab, "About" tab. Start the CVSNT service that you have stopped just now. If you see a list after you entered the last command, you have got your CVSNT setup correctly! The next thing would be to learn to use it with command line! I think I will make another post on it in a few days. If you find that my guide is too simple or simply incomplete, please go ahead to see the sites that I have referred. thanks your information about the cvs-> add user. my supervisor will give me ‘a’liao. Weird, your spam filter seems to be super strict. When I post my thank you message it says that my comment is spam.